AlwaysUp version 11.5 is now available for download! This release delivers a handful of important changes, along with the usual under-the-hood refinements. As you may have noticed, Microsoft has crippled access to Session 0 in Windows 10 Build 1803 and later. And even though the writing had been on the wall for some time, we were still disappointed to see that convenient functionality removed from Windows. But we live in Microsoft’s world, and we must react to their dictates as best we can. Note that your application will continue to run properly as a Windows Service in the isolated Session 0 — you just can’t see it there. You can always select Application > Restart in this session from the menu to bring your program visibly onto your desktop. 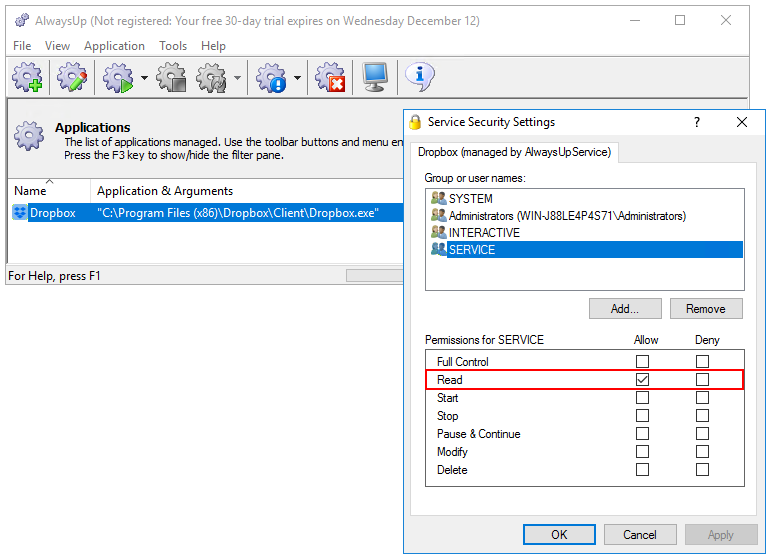 While AlwaysUp would allow you to set who can start, stop or modify each Windows Service it creates, the interface could not show (or grant) someone the ability to simply read the service. This shortcoming was recently addressed in Service Security Editor and we have now done the same in AlwaysUp. Windows Server 2019 was released in October (and re-released in November after some disturbing technical glitches were addressed). 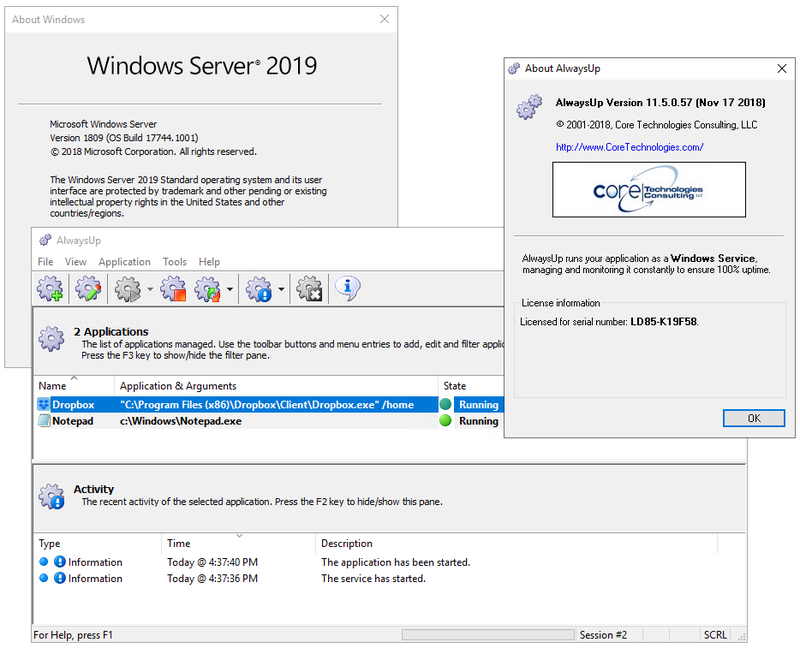 AlwaysUp version 11.5 includes minor technical tweaks to ensure smooth, 24/7 operation of your Windows Services on Server 2019. You can rest assured that AlwaysUp is fully compatible with the new OS. Improved support for the latest builds of Windows 10 and Windows Server 2016. Each major update was thoroughly tested and no issues were found. The registration window now displays the version number — to help customers complete registration on the correct version of the software. 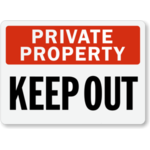 The registration process provides additional labels and informative pop-up messages to help customers complete the process without incident. The enhanced “Help” menu includes a link to our Blog and a link to an article describing how to report problems. When AlwaysUp is running in evaluation mode, the title of the main window now mentions when the 30-day trial will expire. As usual, please review the release notes for the full list of features, fixes and improvements included in this release. If you purchased AlwaysUp version 10 (after January 2017) you can upgrade to version 11.5 for free. Just download and install “over the top” to preserve your existing applications and all settings. Your registration code will continue to work. 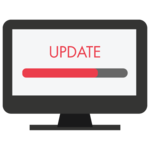 If you bought AlwaysUp version 9 or earlier (before January 2017), you will need to upgrade to use version 11.5. Please purchase upgrades here — at a 50% discount. See the full upgrade policy for additional details.